Wait! Why use GDK-2 when there ate later stable versions you can download for free? Sometimes you use a tool – such as OpenCV – that integrates with GTK-2, and GDK-2. Your operating system may allow you to create custom cursor, or mouse pointers, of your own with colors and an alpha channel (opacity). 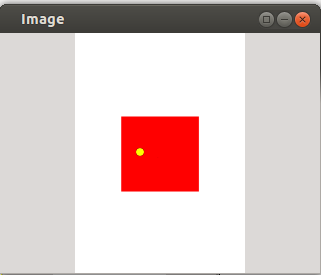 GDK allows you to create a cursor from a pixel buffer (pixbuf), using the function ‘gdk_cursor_new_from_pixbuf‘. OK, but first let’s make a pixel buffer. In the documentation of GDK 3, I found 2 functions to create a pixbuf: gdk_pixbuf_get_from_window and gdk_pixbuf_get_from_surface. The latter does not exist in GDK-2. However, there is one method, I haven’t found documented` It’s called gdk_pixbuf_new_from_data. You can get the data from Cairo after you’ve drawn your image using Cairo. Cairo uses two data types for color channels: double-precision floating-point numbers and unsigned 8-bit integers. The color of the cursor is not as intended when calling ‘cairo_set_source_rgba’. Here, when the cursor is created its color is yellow, but if you save your created image to a file it will be cyan. Yellow cursor over the red square. int stride=cairo_format_stride_for_width(CAIRO_FORMAT_ARGB32, 10); // Will be used later, when we'll create the pixbuf. cairo_surface_t *surf=cairo_image_surface_create(CAIRO_FORMAT_ARGB32, 10, 10); // A canvas of width 10 and height 10.
cairo_set_source_rgba(cairo_ctx, 0., 1., 1., 1. ); // Double precision values for Red, Green, Blue and Alpha channels between 0 and 1.
cairo_fill(cairo_ctx); // Fill the circle with cyan, though we've intended to create a yellow one. guchar *data = cairo_image_surface_get_data(surf); // The data is in BGR, reverse order of RGB !!! “cursor” in this function is a global variable of type “GdkCursor *”.Now, to add the cursor to a window, use gdk_window_set_cursor.